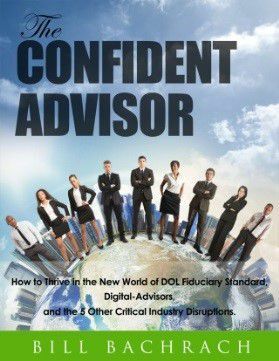 The Confident Advisor; How to Thrive in the New World of DOL Fiduciary Standard, Digital-Advisors, and the 5 Other Critical Industry Disruptions. There are 7 critical conversations necessary to engage people in ways that predictably turn leads into prospects, prospects into clients, clients into people who take action on your advice, happily pay you for planning and advice, and introduce you to their friends, family, and colleagues. Consider what could happen to the quality of your client service and the value of your business when you can artfully engage anyone, any time, and anywhere. The end result is that you can gain more wallet share from existing clients and acquire additional high-value clients. Download your complimentary copy of Bill Bachrach’s new “enhanced” eBook The Confident Advisor; How to Thrive in the New World of DOL Fiduciary Standard, Digital-Advisors, and the 5 Other Critical Industry Disruptions. Go to http://www.billbachrach.com/e-book/ and download it right now so you can read and apply these 7 critical conversations and create the kind of business you truly want.